The kitchen is a room of your home you spend time in each and every day; there’s no denying it, especially when you have a fresh, newly completed Signature Kitchen! Try out these ten tips for making the time you spend here even better. 1. Think about your old kitchen. Take a moment to think about your old kitchen. Think about what you liked and disliked about where things were kept. Were you able to find what you needed when you needed it? Make a list of things you use on a daily basis. 2. Communicate with Signature. Even after your initial meeting, continue communicating with the Signature Kitchen staff about how you envision your space. Let us know if you’ve found any additional inspiration spaces or other requests arise. 3. Go through your kitchen items. While our teams work on creating your dream kitchen, take this time to be proactive. Go through all of the items that were in your kitchen and weed out things like expired food, cracked or broken items, and things you haven’t touched in six or more months. This will help set you up for organizational success once the project is completed. • Flooring is being laid – Take a look at your cleaning products and process. Throw away and products you don’t use and make a plan for regular cleaning of your kitchen space (and beyond). • Cabinets are installed – Put together your boxes of pots, pans, silverware, smaller appliances, and other kitchen items and plan out where you intend to store your items. • Appliances have been delivered – Take this time to go through your recipes, cookbooks, and kitchen notes. Remove anything you don’t use or could live without. Plan a space for storing these. 5. Settle in. Once your space is complete, there’s no need to rush into moving everything back in. Take your time and be sure that nothing goes back into the space that you don’t or won’t use. Even though our crews put the Signature spin on your space, it’s your home and it needs to function as a space in your life. So put your own signature on it and let us know what we can do to be of assistance by calling (772) 234-0155. As a company rooted in Vero Beach, FL, the beach and ocean waters play a major role in designing many of our clients’ Signature kitchens and baths. If you peruse our portfolio, you’ll find an atmosphere only otherwise found along one of the many local coastal beaches. We utilize both bright and airy color palettes to help bring that beautiful beach vibe indoors (without the sand, of course). We believe that the beachside lifestyle is one many of our clients crave. Therefore, we utilize whites, blues, and soft tans in our cabinetry and overall designs to anchor this feeling in the space. The kitchen is one of the most frequented spaces in a home. This means that we have the privilege of working with the space our clients spend the majority of their time in. With this in mind, we’re sure to craft our designs in a way that makes the client feel at ease, at home, and welcomed. When thinking of visiting the beach and the coast, usually thoughts of days off, vacation, leisure, and luxury come to mind. We want our clients to feel this each and every time they enter their newly designed kitchen space. 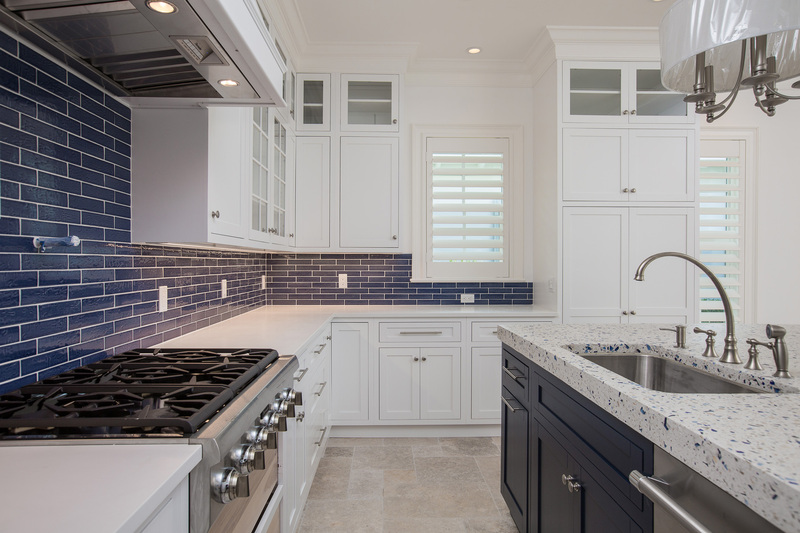 The white cabinets mirror the crests of the rolling waves; our Signature cobalt blue island representative of the deep waters hidden beneath. Our natural stone countertops mimic the complexity of the beach sand that seems to follow you anywhere. 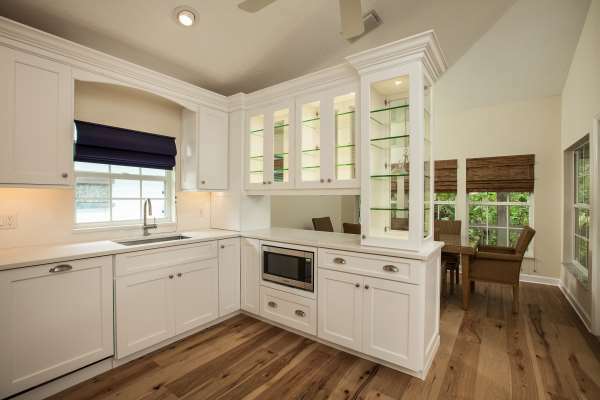 Even our cabinets are designed to be airy and open with window-style detailing throughout. “We love using glass because it allows the natural light to pass through the cabinets and really brightens up a room!” says Cabinet Designer Ashley Stock. 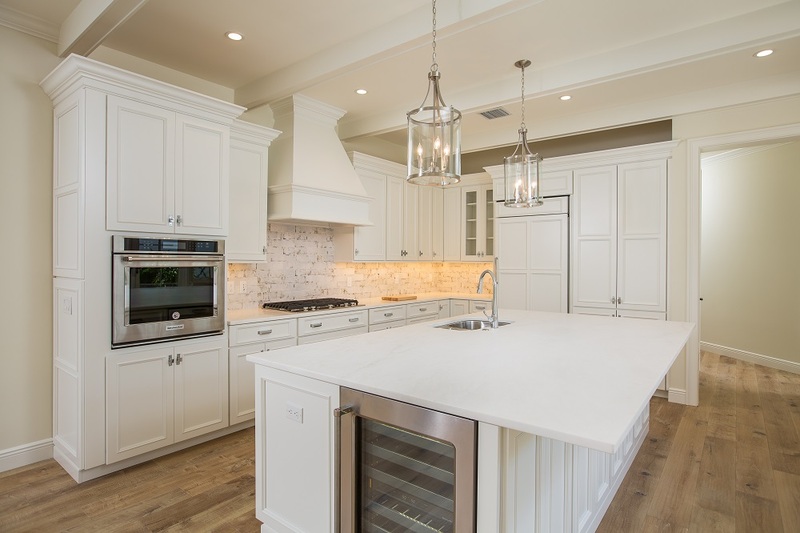 As the only name on the Barrier Island for unparalleled professionalism and quality, the designers and staff at Signature Kitchens of Vero Beach continually challenge themselves to go above and beyond our clients’ expectations right down to the last detail. While it seems simple enough, our team is intentional in the choice to include these features. The use of this glass detail does a few different things for the space: it livens up what could be viewed as a drab, uniform wall of cabinets, adding visual interest; it allows light into an otherwise traditionally dark and concealed space; similarly, the glass panels reflect the light of the room, adding mirror-type qualities; and finally many of our clients enjoy having a designated space in which to showcase their belongings. Whatever you desire for a space, our designers will craft a custom kitchen or bath space that is not only functional and practical but beautiful, too. Alongside large cabinets and long countertops, our favorite details are the smaller ones, like glass-paneled showcase cabinets, that really set Signature apart. When you choose to work with Signature Kitchens of Vero Beach, we take a room in a house and help make it your favorite space in your home. Interested in seeing some of our spaces? Stop by our newly remodeled designer showroom located at 3003 Cardinal Drive, Suite D in Vero Beach, FL.